In my last article i wrote about Pace and Recovery and how important it was to get enough rest to be able to perform the interval at the same pace as the previous. This Article aims to highlight some more areas that can be marked for improvement. I recently coached a session at JBR Tri Club. The session was a slightly modified version of 400m with decreasing recovery. See below table for the actual work out. We are still in our BASE phase of training so we still want to be running very much Aerobically, we want the body to easily adapt to the stresses placed upon it along with increasing lung capacity along with the body's ability to metabolically convert oxygen into usable energy, along with increased blood flow toward the working muscles through capillirisation. The aim of the session this time of year was not to run the 400m intervals at break neck pace but more of a comfortably hard effort, Say Medium effort or RPE 6-7. The intensity of the session would build with the decreasing of recovery time throughout the set. The most important part of any session is to understand WHY you are doing it. What were we trying to achieve: Pace Consistency across the set. I know how hard this is to master, it takes some time to get it right. The benefits of mastering the ability to feel how your running and tuning into YOU is one i like to coach into my athletes. I picked this up from my coach ( Coach Neil ), he kept on drumming into me the importance of knowing your pace at any given time and taught me not to rely too much on the watch on my wristband that my biggest indicator of effort was ME, MYSELF and I. One of the biggest problems for any athlete is going off too fast and then not being able to maintain the given pace at the end of the session or even worse the event you have been training for. We all know what its like at the beginning of a race, you get caught up with the atmosphere and before you know it your running 20 secs per km quicker than you intended to. 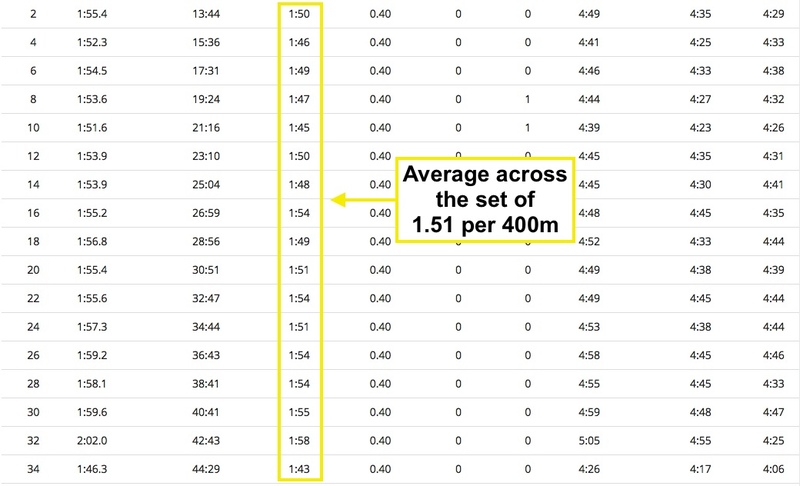 I have got a table below of an athlete who ran the 400m efforts during the club session, this athlete is trying to dial into themselves and although the intervals are not too bad there is still room for improvement a big difference to the first few intervals and the last few. When looking at charts i tend to eliminate the first effort and last, these two often indicate false readings, the first effort is often far to zealous and the last one the effort tends to go up because the athlete knows they are finishing so tends to push it harder than during the set. Looking at the table immediately you can see a drop off from the initial pace. Some would argue that it would be expected because of the drop in recovery throughout the set. From experience i know that if the above athlete would of ran his initial intervals at 1.51 per 400m he would and could of maintained that throughout the session. The effects of going out to hard in the beginning had a dramatic effect on the last portion of the session. I will once again quote Coach Neil and i remember these words said to me. Its hard enough holding an even pace let along going off too hard at the start. The point here is, go out too fast and your going to pay for it in the latter part of any race. During this set the whole principle is you allow the lack of recovery to do the work which will increase the perceived effort, there is no need to increase the actual effort. If your an experienced athlete but looking to enhance your next season and/or are taking on in an event for the first time and would like to talk to me, just email me by CLICKING HERE.